At Weikert's Egg Farm the eggs are produced the old fashioned way with happy, free walking hens. 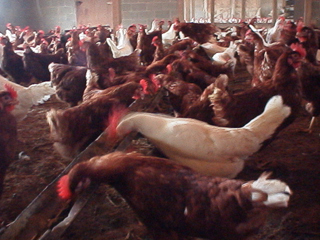 The chickens live a life much different from those on large industrial plants. Our chickens can walk, run, scratch and fly freely within their rooms. Their expansive rooms full of windows allows them to receive daylight, something other chickens never see in their entire lifetime. They are free to roost, eat, and drink as they please. A high quality feed with alfalfa meal is fed to insure delicious eggs with deep colored golden yolks. The eggs are collected by hand from the nests twice a day in baskets, washed and immediately cooled before grading and packing to preserve their inherent freshness. Eggs may be purchased at the farm store seven days a week. Home delivery may be possible along one of our established routes. Weikert's Egg Farm serves the finest restaurants and bed and breakfast establishments in Gettysburg and the surrounding area as well as numerous convenience stores in both Pennsylvania and Maryland. If you are a business owner or manager and would like Weikert's Egg Farm to serve you, contact us at 717-334-3727.